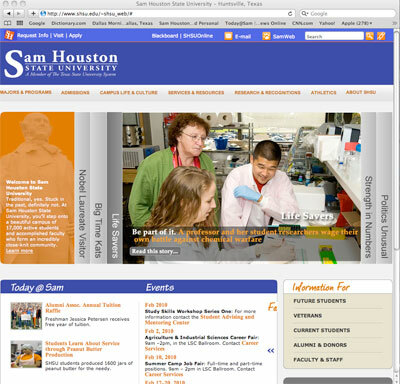 Sam Houston State University will unveil its redesigned Web site when it goes “live” on Feb. 4. More than two years in the making, SHSU president Jim Gaertner authorized the Web site redesign project in October 2008 as part of the marketing effort for the university. The goal of the new Web site is to both brand the university and catch the attention of potential students so that they will apply. The redesigned site will be a resource for potential students to find the information they need. "This two year project involved hundreds of students, faculty, and staff interviews, multiple departments working together, and many hours of hard work," said Ann O'Meara, SHSU marketing director. "Stamats, a leading university marketing company, was engaged to design a dynamic Web site reflecting the success and beauty of SHSU and one that is highly functional for visitors, prospective students, and everyday users," she said. The fast links will be available from the chain link icon at the top. Campus Calendar will now be found from the main page by clicking “Campus Life & Culture” and selecting “Calendars” on the right-hand menu. Catalog/Schedule of Classes will now be found from the main page by clicking “Current Students” and selecting “Catalog” or “Schedule” from right-hand menu. The Blackboard and SHSUOnline links will be located at top of page. Transfer information will be found by clicking “Admissions” and selecting “Transfer Students” from the right-hand menu. Colleges may be found by clicking "Majors & Programs." Within 18 months of “going live,” Information Resources anticipates having all departmental pages redesigned and upgraded to a new content management system. “We’re working with our systems team hand-in-hand to make sure everything is done according to the industry best practices,” Jurden Bruce, web administrator said. The Web site redesign committee was comprised of Heather Thielemann, Frank Holmes and Ann O’Meara, Mark Adams, Keri Rogers and Thelma Mooney. For more information, or to see a prototype of the new Web site, visit http://www.shsu.edu/~shsu_web/.